« AstroTech AT10RC and Celestron CGE Pro – First Light! Plagued with one of the worst bouts of “new telescope cloudiness”, it’s been mostly rain for weeks now. Add a nice slice of “can’t view the lunar eclipse tonight because of the clouds”, and one is left with nothing more than memories… or old data to process! Case in point here is NGC 7635, a beautiful emission nebula about 10,000 light years away (or if you prefer, sixty quadrillion miles. Not a walk in the park!) The “big bright shining star” inside the bubble here is actually responsible for the bubble itself by exciting nearby gas and dust. As seen in the four inch Televue NP101is, this target is quite nice for such small aperture. 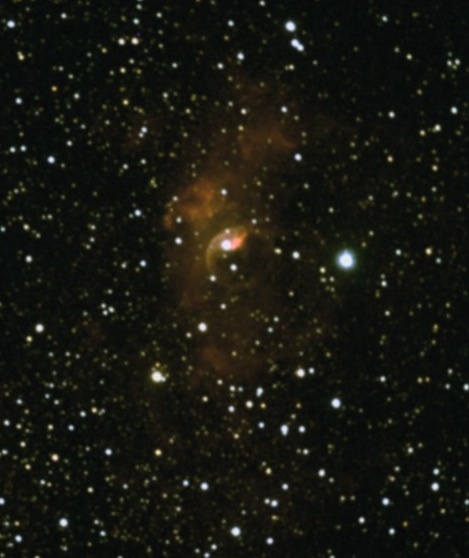 This stack was performed in Nebulosity, using 10x 5 minute exposures. As typical for this setup, guiding was done with the separate Stellarvue 60mm and the Orion StarShoot AutoGuider. Imaging camera was the Orion StarShoot Pro v2.0 Color with the SkyGlow Imaging Filter. 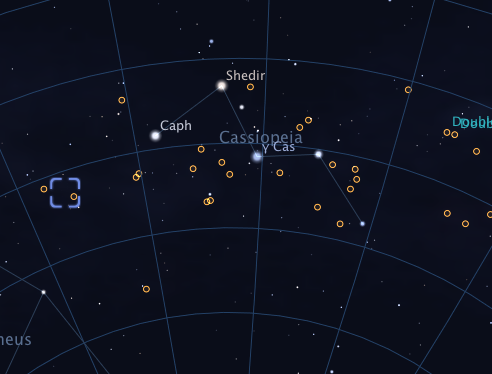 To find the Bubble Nebula, start with Cassiopeia. M52, a globular cluster is right along the line connecting Shedir to Caph about 1.5 times the length of those stars apparent distance. Typically photographed with M52, the Bubble Nebula will be right off to the side – and is often easy to spot due to the bright central star. This entry was posted by admin on December 20, 2010 at 7:03 pm, and is filed under Nebulas. Follow any responses to this post through RSS 2.0.You can skip to the end and leave a response. Pinging is currently not allowed.